What do you call it when an individual gets into a cockpit of a plane and obeys orders to spray toxic chemicals high in the sky on a daily basis? I call it the greatest crime of all time. One need only to believe ones own eyes, see the huge lines in the sky and do your own research to acknowledge why this argument is a strong argument to consider. 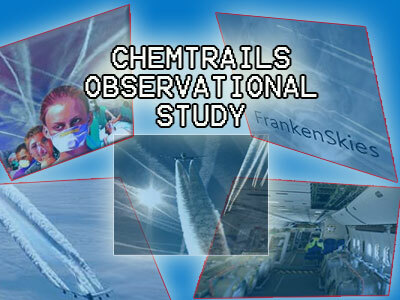 We decided to do a little research and make available a simple chemtrails tracking webpage for tracking the globalist’s geoengineering crimes in Los Angeles for 30 (actually 31) days during the month of February- March 2013 and the results are in. What can we learn from simple observations? -Forecasts were changed in some cases one or two days prior to the day to apparently match whatever atmospheric chemical manipulations were going on that week. - The news networks that put out the weather predictions not once bothered to address the sprayed chemical trails that altered the weather. The overall mass media-government silence on the issue was the most concerning. -Spraying occurred with no particular pattern with regard to days of the week. -Random people vary in terms of knowledge and awareness of these ongoing crimes against humanity but the actual spraying didn’t seem to arouse any alarm in the general public regardless of amount of spraying. Conversely many in the general public are aware of these crimes but feel helpless to be able to do something about it. -It was observed that the chemtrails terrorist pilots begin to spray all at once if and when working in teams; often either early in the morning or by 10-11AM. Once the first plane was seen to start spraying, then simultaneously other planes appeared at different parts of the sky flying at apparently the same altitudes also spraying in the same PATTERN as the other planes so as to create a parallel grid in the sky. The teamwork was clear and obvious every time. -Conversely, when the chemtrails environmental terrorists took to the sky to do their assignment it was observed that all other planes in the sky (not involved in the parallel spraying) did NOT emit any contrails. In other words, at any given moment even though many planes are in the sky at one time (easily confirmed in flight tracking sites), only those one or two particular planes were seen spraying chemicals that alter the sky and the weather. Did someone not tell the other planes that they are supposed to be making contrails? -Spraying was seen to coincide with abrupt temperature and weather changes, usually within a few days or sooner. For example, a long string of sunny warm days could be terminated with one massive day of spraying. Following the day of spraying, cooler, cloudy and sometimes rain will follow shortly. Are YOU someone who has shut off the critical thinking portion of your brain and given in to Government Kool-Aid drinking conspiracy theorists who say that all the spraying is nothing more than contrails? Are you a blind believer in the ‘persistent contrails’ conspiracy claims made by paid government trolls and shills? Do you believe in the never before proven Government studies conducted in 2000 that was supposed to prove that normal planes can randomly emit a condensation trail that magically and inexplicably persists long enough to actually change the weather? Have you ever asked yourself why a government so deeply in debt would spend money to conduct an experiment to prove that persistent contrails are real when they could have use that money on other more important issues? Have you ever demanded to see the actual experiments that were done in these secret government studies? Do you know the difference between an ABSTRACT and an actual experimental study? Do you think that a claimed government Abstract IS the study itself? Ask yourself, have you been knowingly or unknowingly siding with the powerful dark globalist forces on this environmental terror issue? Take time to think on your own and join us in exposing these crimes. Exposing these crimes start with exposing those who want to defend the crime and that means anonymous bloggers who don’t want you to think on your own so they resort to CIA mind-control buzz words like “conspiracy theory”. Every time you hear that word it should draw a red flag in your mind to remind you that you are being manipulated by government propaganda mind control goons who need you to stay uninformed about the issue. As alluded to earlier, this simple observational prospective study was intended to show that any small effort of tracking these environmental crimes can be productive and can be used as a tool to increase awareness of the issue. I firmly believe this is the greatest overall crime of all time and I hope that some day justice will be served. Until then please do what you can to protect and detoxify yourself from the ongoing exposure of metals we are subject to and do everything you can to expose these crimes by sharing this information, being pro-active and doing your own research.